A strong oxidizing agent must be formed which can take water and oxidize it to dioxygen. We know that redox reactions occur in the direction of stronger to weaker oxidizing agent (just as acid base reactions are thermodynamically favored in the direction of strong to weak acid). Somehow we must generate a stronger oxidizing agent than dioxygen, which often has the most positive standard reduction potential in tables. Finally, plants need an abundant source of ATP which will be required for reductive biosynthesis. We will discuss only the light reaction of photosynthesis which produces these three types of molecules. The dark reaction , which as the name implies can occur in the dark, involves that actual fixation of carbon dioxide into carbohydrate using the ATP and NADPH produced in the light reaction. Photoexcitation of the non-reaction center chlorophyll turns that molecule into a good reducing agent, which transfers its electron to the nearest excited state level of the reaction center chlorophyll. If you count both step together, the non-reaction center chlorophyll gets "photooxidized", in the process producing the "strong" oxidizing agent which is the positively charged chlorophyll derivative. The extra electron passed onto the second molecule will eventually be passed on to NADP+ to produce NADPH. 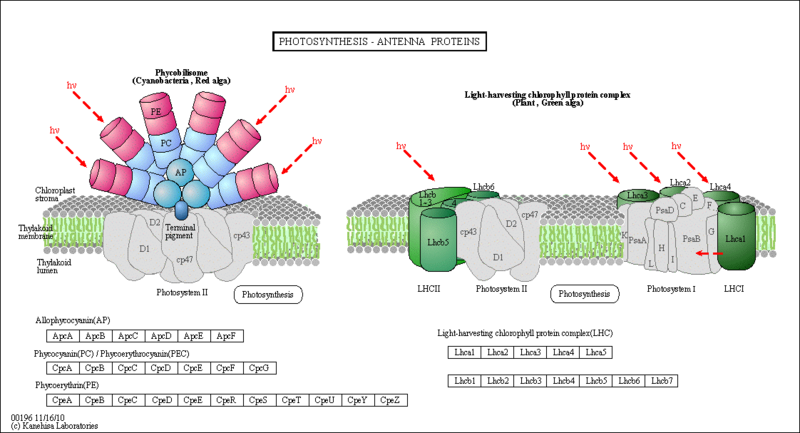 The light reaction of photosynthesis in green plants is shown below. In this process, in a scheme that is reminiscent of electron transport in mitochondria, water is oxidized by photosystem II. Electrons from water are moved through PSII to a mobile, hydrophobic molecule, plastaquinone (PQ) to form its reduced form, PQH2. 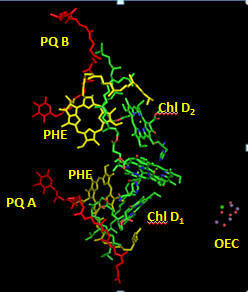 PSII is a complicated structure with many polypeptide chains, lots of chlorophylls, and Mn, Ca, and Fe ions. 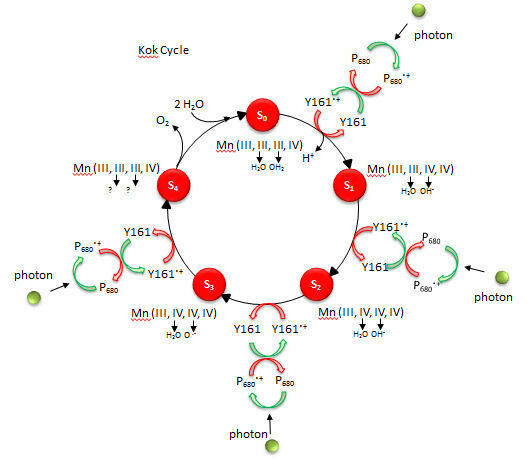 A Mn cluster, called the oxygen evolving complex, OEC, is directly involved in the oxidation of wate. Two key homologous 32 KD protein subunits, D1 and D2, in PSII are transmembrane proteins and are at the heart of the PSII complex. 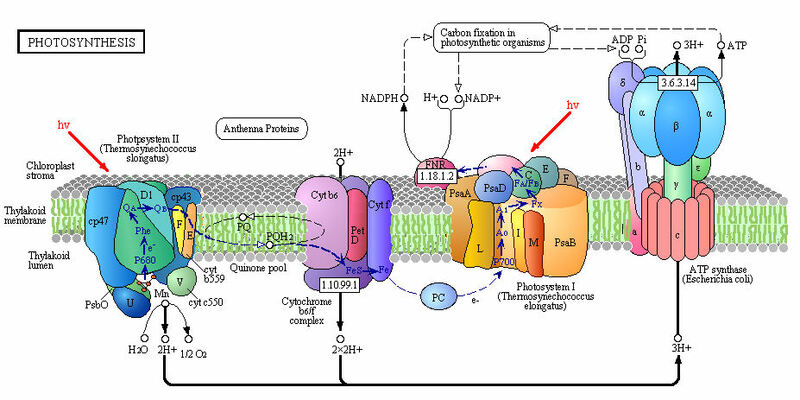 Another photosystem, PS1, is also found further "downstream" in the electron transport pathway. It takes electrons from another reduced mobile carrier of electrons, plastocyanin (PCred) to ferredoxin, which becomes a strong reducing agent. Ferrodoxin is a protein with an Fe-S cluster (Fe-S-Fe-S in a 4 membered ring, with 2 additions Cys residues coordinating each Fe). It ultimately passes its electrons along to NADP+ to form NADPH. A summary of the light reaction in plants and standard reduction potentials of the participants, are shown below. Note that many of the complexes produce a transmembrane proton gradient. In contrast to mitochondria, the lumen (as compared to the mitochondrial matrix) becomes more acidic that the other stroma. Protons then can move down a concentration gradient through the C0C1ATPase to produce ATP required for reductive biosythesis of glucose. The net reaction carried out by PS2 is the oxidation of water and reduction of plastoquinone. Note that water is not converted to 2H2 + O2 , as in the electrolysis of water. Rather the Hs are removed from water as protons in the lumen of the cholorplast, since the part of PSII which oxides water is near the lumenal end of the transmembrane complex. Protons required to protonated the reduced (anionic) form of plastaquinone to form PQH2, an activity of PSII found closer to the stroma, derive from the stroma. which then can be used to protonated the "anionic" form of reduced PQ to form PQH2. A quick look at standard reduction potentials shows that the passing of electrons from water (dioxygen SRP = +0.816 V) to plastoquinone (approx SRP of 0.11 ) is not thermodynamically favored. The process is driven thermodynamically by the energy of the absorbed photons. 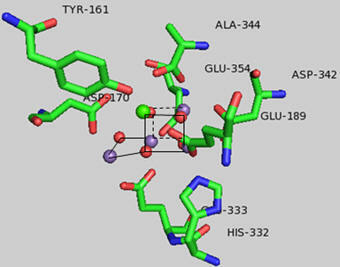 An early crystal structure of PSII from a photosynthetic cyanobacterium showed that it consists of 17 polypeptide subunits with metal and pigment cofactors and over 45,000 atoms. (Zouni, Nature, 409, 739, 2001). 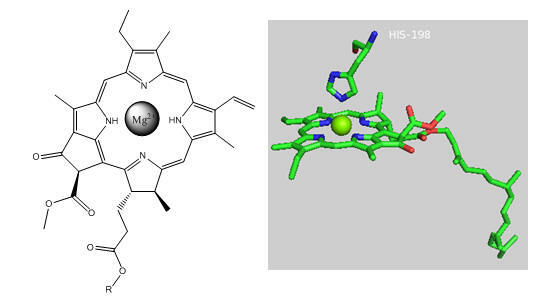 Of particular interest is the P680 chlorophyll reaction center, which consists of four monomeric chlorphylls adjacent to a cationic Tyr-D side chain which destabilizes the chlorophyll molecules. When H2O gets oxidized to form dioxygen, 4 electrons must be remove by photoactivated P680. In PSII, this process occurs in 4, single electron steps, with the electrons first being transferred to a Mn4 cluster cofactor (of composition Mn4Ca1Cl1-2(HCO3)y. This inorganic Mn cluster is often called OEC (oxygen evolving complex) or WOC (water oxidizing complex). 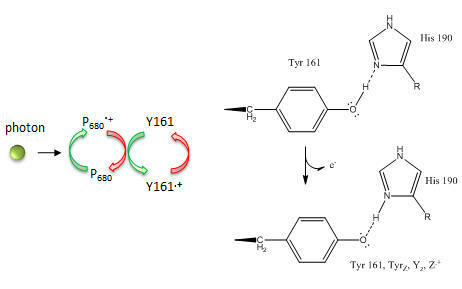 The electrons passed through the Mn complex are delivered to P680 by a photoactive Tyr free radical (Tyr Z). 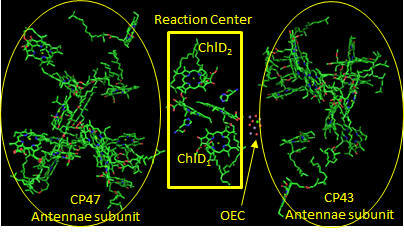 The actual structure of the OEC could not be resolved in this structure, but other structural and spectroscopic data support the structure below (Chem. Rev., 2001, 101, 21-35), which also shows a possible mechanism for electron and proton transfer from water to form dioxygen. 5 discrete intermediates of the OEC, S0-S4, are suggested from the experimental data (Kok cycle). These were postulated from experiments in which spinach chloroplast were illuminated with short light pulses. A pattern of dioxygen release was noted that repeated after 4 flashes. Ultimately, light absorption by P680 forms excited state P680* which donates an electron to pheophytin (which passes them to quinones) to form P680+, which receives electrons from the OEC, specifically the TyrZ radical. As we will see in a bit, this structure and mechanism has been called into question by new crystallographic structures. Investigators have made non-peptide mimetics of superoxide dismutase to facilitate therapeutic removal of excess superoxide formed in brain and heart tissue. These may arise after an oxidative burst from reperfusion of these tissues after heart or brain attacks. Likewise, scientist are trying to build synthetic PSII-OEC complexes which could be used to form dioxygen or hydrogen gas for fuels. electron transfer from P680 to a nearby chlorophyll with a lower energy level for the excited state electron occurs. This chlorophyll has 2 H+ ions in the chlorophyll instead of Mg2+occurs. The P680 now becomes cationic, P680+. This "anionic" chlorophyll transfers an electron to oxidized plastoquinone. The P680+, a strong oxidizing agent, removes one electron from H2O-OEC complex. Steps 1-4 repeat three more times, each requiring another photon and each cycle producing another electron which passes on through the system. Remember that when O2 acts as an oxiding agent, it gains four electrons. The first produces superoxide, the next peroxide, and two more produce oxide which when protonated is water. Hence two waters and four cycles are required to remove the four electrons required to produce dioxygen. A similar mechanism is found in PSI, except plastacyanin, not dioxygen is oxidized, with electrons moved to ferrodoxin. This is likewise a difficult process since the reduction potential for oxidized plastocyanin (the form that can act as a reducing agent) is +0.37 while for ferrodoxin it is -0.75. This transfer of electrons is an uphill thermodynamic battle since the more positive the standard reduction potential, the better the oxidizing agent and the more likely the agent becomes reduced. What drives this uphill flow of electrons. Of course, it is the energy input from the photon. The crystal structure of PS2 from T. vulcanus has significantly improved our understanding of the OEC and electron flow on water oxidation.Because of its similarity to other pathways you have studied, we will concentrate on developing an understanding of the amazing Photosystem II from Thermosynechococcus vulcanus, a cyanobacteria (19 subunits with 35 chlorophylls, two phenophtyins, 11 beta cartotenes, 2 plastoquinones, 2 heme irons, 1 non heme iron, 4 Mn ions, 3-4 Ca ions, 3 Cl ions, 1 carbonate ion, and around 2800 water molecules). Nature has appeared to evolve a single gene for the part of PSII that binds an inorganic cluster involved in oxygen formation. The cluster is called the Oxygen Evolving Complex (OEC) and is bound to a central protein in PS2. The cluster, Mn4CaO5, appears identical in all photosynthetic organisms, and is shown below. Researchers were surprise to find that the Ca ion was an integral part of the basic geometric “framework” of the OEC instead of a Mn which was found to be “dangling” from the basic geometric framework. 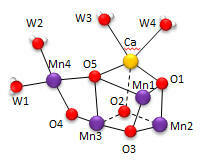 The shape outlined by O5-Ca-O1-Mn1 and Mn3-O2-Mn2-O3 is similar to what organic molecule? Describe how every two adjacent Mn are linked. Describe the coordination of Ca. Four waters (W1-W4) are coordinated to the OEC. No others were found in the region. What role may some of the waters have in the complex? The OEC can be thought of as a distorted chair with a Mn3-O4-Mn4-O5 back. Bonds to O5 are longer than the other bonds. What might that imply about the strength of the bonds compared to the other metal-oxygen bonds? What is the expected charge of the oxo ligands in the OEC? If the metal-O5 bond lengths are longer than the others, what might that imply about the charge on O5? Would it be consistent with a ligand other than an oxo ligand? What might it be? Which waters are most proximal to O5? Ultimately an O-O bond must form between two waters. Which are the most likely candidates based on the structure above? Which ion, Ca or Mn, would most likely be involved in electron transfer to water oxygens? Write the electron configuration for both ion. Standard reduction potentials for Mn are shown below. What is the oxidation number of Mn in each compound. Which oxidation state might be sufficient for the oxidation of H2O in the OEC? 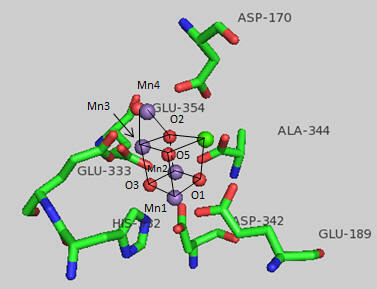 The first structure of OEC above shows the two di-m-oxybridges that connect Mn4 to Mn1 and Mn3. This might give us clues as to the mechanism of water oxidation by the complex. To form O2, two water molecules are required as substrates. Presumably they bind as waters between adjacent Mns . What reaction intermediates may be bound to the Mn as water converts to O2? How many electrons are required for the complete oxidation? The enzymes that catalyze hydrogen production are hydrogenases (not dehydrogenases). Note that the name hydrogenases best reflects the reverse reaction when a molecule (P) in an oxidized state gets reduced (to S) and H2 gets oxided to H+. 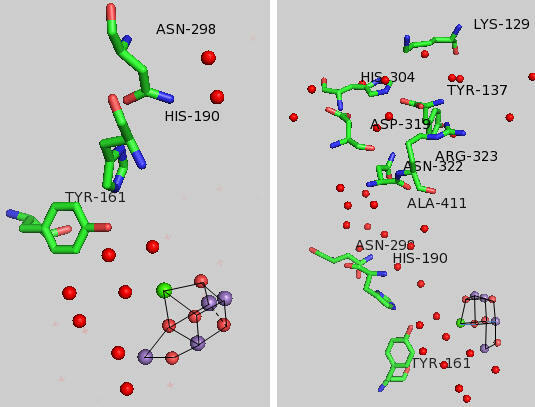 Crystal structures of hydrogenases show them to be unique among metal-containing enzymes. They contain two metals bonded to each other. The metal centers can either be both iron or one each of iron and nickel. The ligands interacting with the metals are two classical metabolic poisons, carbon monoxide and cyanide. Passages for flow of electrons and H2 connect the buried metals and the remaining enzymes. The metals are also bound to sulfhydryl groups of cysteine side chains. It appears that two electrons are added to a single proton making a hydride anion which accepts a proton to form H2. In the two Fe hydrogenases, the geometry of the coordinating ligands distorts the bond between the two iron centers, leading to irons with different oxidation numbers. Electrons appear to flow from one center to the other, as does carbon monoxide as well. Ultimately, hydrogenases or small inorganic mimetics of the active site could be coated on electrodes and used to general H2 when placed in water in electrolytic experiments.